Yes, women in STEM do need all the other kinds of support Ross lists. But, I feel it also supports women in STEM to point out to Dr. Taylor and others in question that they should be conscious of avoiding such gender-biased decisions -- in this case, fashion ones -- in the future. In fact, some of us are also pretty disturbed why no one at ESA bothered to speak up and mention that to him so he could change his shirt before he went on video. About the shirt itself -- Taylor was wearing a black polo underneath. I think the video producer, or the reporter, could have quick said something either neutral like "that shirt won't look good on TV," or even more frank "that just won't encourage women scientists of the future," and adding "we see you have a black polo underneath, let's go with that". But, they didn't say anything. To me, I think it's good it didn't go unnoticed by the media. Things don't change unless people talk about them. I didn't watch this play out on "secondary media", heard about it third or fourth hand - from a female colleague talking about the #shirtstorm Twitter controversy. I think it's good this is getting a bit of conversation out in the open about this -- just like this blog (and counterpoint) here. 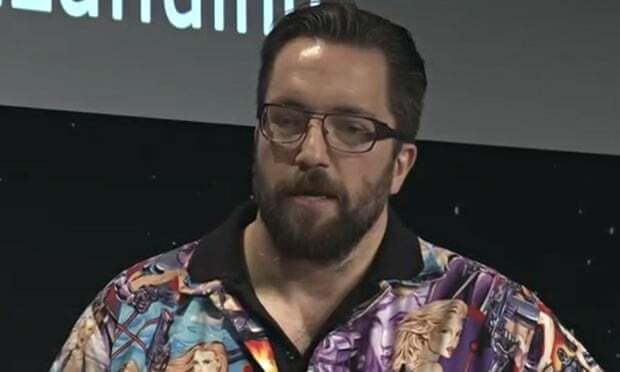 Now, other women can chime in and debate -- maybe that wasn't just an ugly shirt to wear to work -- in this context, he may not have realized it, and he may have even had the best intentions, but hey -- some of us think that sure was a sexist shirt to choose to wear to work, and on worldwide TV, that particular day. And I think we need to get to a place where close colleagues feel more comfortable talking to each other to acknowledge (or head off) diversity faux pas, instead of the discussion needing to wind up with crying on TV -- "psst, maybe you should dress up a bit for the press conference for millions, or at least change that shirt?" Here's hoping this small firestorm, including this counterpoint, contributes in a small way to scientists thinking about -- and talking through! -- how small actions may be influencing the diversity and climate of their research lab environments every day. And hey, wouldn't it be great if a diverse set of people is inspired -- and has the environment where they feel welcome -- to contribute to solving these STEM challenges in the future?